Some neighbourhoods in Greater Manchester face major problems. All of the money and talking over a long time has changed little for people who have the hardest lives. They often feel ignored, powerless and a long way from where decisions are made. Professionals can find it very difficult to tackle severe and multiple disadvantage. This is when clusters of problems happen in people’s lives. It is hard to change complex systems. How organisations work, often doing things to or for people, can make things worse. The most difficult issues are often avoided. These ‘elephants in the room’ include inequalities in power and wealth. Most of the time these people try to find ways to overcome these challenges alone. Sometimes they have blamed each other for these challenges. We think blaming each other makes things worse. People with lived experience and professionals need to work together. They each have different skills, knowledge and experience to offer. Everyone has strengths that are needed to produce solutions. All types of power must be shared, and unequal power addressed. Good relationships are crucial. They need time, respect and trust. Diversity of people is important for high quality thinking. There are different types of knowledge. Lived experience is valuable. It is important to test new ideas. There is no failure, just learning. 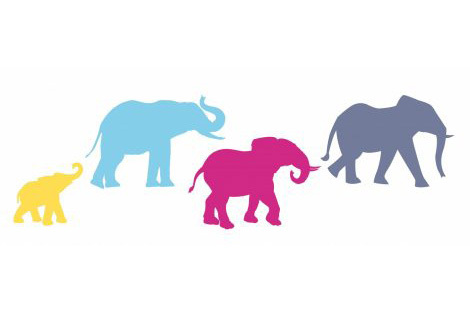 The Elephants Trail is a partnership between CLES, Creative Inclusion, Greater Manchester Combined Authority, Inspiring Change Manchester, Lankelly Chase Foundation, Petrus Community, and Unlimited Potential. Our learning partner is Newcastle Business School. The scale and complexity of the challenge demands that we really try something different and experiment. The Elephants Trail builds on the learning from the Elephants project in Greater Manchester in 2016-2017. It is about people with lived experience and professionals working equally together to solve the challenges that people face. This is sometimes called ‘co-production’. With each small team of citizens and professionals, we aim to create ‘Elephants spaces’. These are spaces where everyone feels relaxed and informal. They can then leave their ‘labels’ at the door. The Elephants Trail starts with exploring and building relationships between people from very different backgrounds and life experiences. Getting to know each other enables discussion about power, inequality and the most difficult issues. Each team then shares influence and makes decisions together. This includes deciding what they will work on. The Elephants Trail makes use of approaches such as Deep Democracy. This means ‘leaning’ into situations where there are differences and tensions and saying what needs to be said, rather than using power and rank. The teams actively work together for practical change on an issue that directly affects the lives of people with the hardest lives. The aim is to create long-term solutions in which people believe and trust. Along the way, the teams learn together about not only the issue and each other, but also how to work together effectively. Some people have described their Elephants experience as ‘life changing’. The Elephants Trail will run from April 2019 to March 2020. Each team will meet together about once a month, with actions taken in between. We thank Greater Manchester Combined Authority and the Lankelly Chase Foundation for their support and funding for the Elephants Trail. Some people have described their Elephants experience as ‘life changing’.